These are service records of ratings and officers in the Royal Naval Division (RND) during the First World War. They consist of all the surviving service records, held in series ADM 339, for anyone who joined the RND between 1914 and 1919. The Royal Naval Division, formed in September 1914, fought on land alongside the Army in the First World War. It consisted of personnel brought together from the Royal Naval Reserve, Royal Fleet Reserve, Royal Naval Volunteer Reserve, a brigade of Royal Marines, Royal Navy and Army personnel. Be careful with the use of quotation marks as this can hide some potential matches. For instance if you search for “John Thompson” it will not find “John Arthur Thompson” or “Thompson, John”. 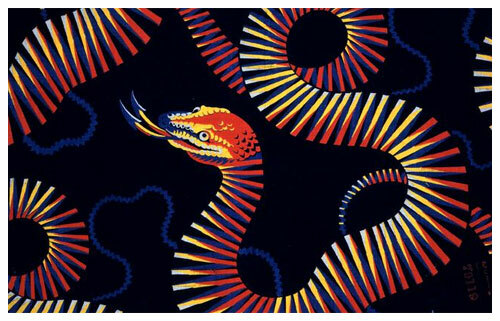 Some of the records indicate place of birth and swimming ability. The majority of these records were typed and are therefore very easy to read. Some abbreviations are obvious (‘V.G.’ for ‘very good’, ‘NOK’ for ‘next of kin’). Other abbreviations are less clear, but often they refer to administrative forms or offices. There are slight variations in the layout. You can see examples below from the service records of a rating and of an officer. 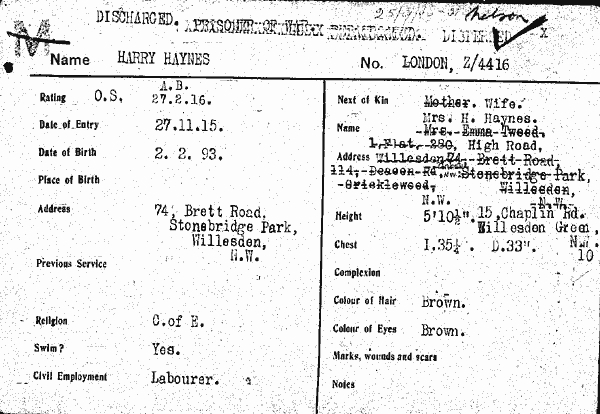 The first two images have been extracted from the service record of Able Seaman Harry Haynes. The first page of the record gives us an idea of his physical appearance and reveals the names and addresses of his mother and of his wife. Although there are no details, this service record indicates that he married after 27 November 1915 and before 23 February 1919. His record also shows that he was a prisoner of war and the third page gives more detail about this time. The second example is taken from the service record of the poet, Rupert Brooke, who served as a lieutenant. The first page includes the battalions Brooke served in, Anson and Hood, and his mother’s name and address, while another page features the report of his death which appeared in The Times and the official cause of death. Elsewhere in the record you can find details of his burial place. Ratings who died in service were officially recorded as ‘discharged dead’. 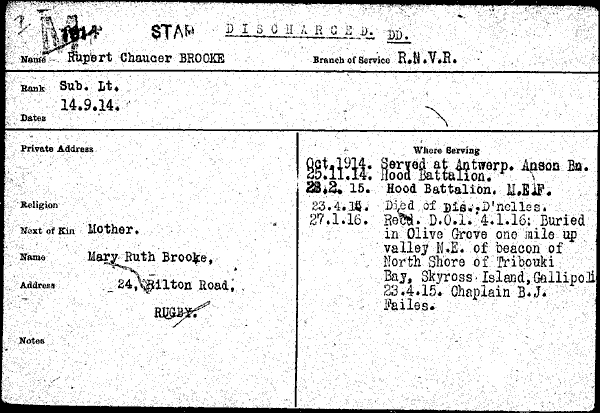 You can find these two pages in the service record of Leading Seaman Charles Edgar Stirling. In addition to a physical description and family information, the first page shows that he had been a student when he entered at the age of 18. The second extract from this service record shows that he was reported as having been killed in action in France on 13 November 1916. He was 19 years old. Elsewhere in the record there are details of where he was buried initially, when the body was exhumed and where he was finally laid to rest. Some records of RND officers are kept with the service records of officers in the Royal Navy or the British Army. If you are looking for the record of an RND officer and you can’t find it here, try looking in series ADM 337, ADM 196, WO 339 or WO 374.